Heading into this UCLA game, there has been a lot of talk nationally about BYU. Why? Because they have won the first two games of their schedule in somewhat miraculous fashion, despite being the underdog in both games. The last second hail Mary at Nebraska and the last minute 4th and 7 desperation throw against Boise State made highlight reels and have provided a lot of buzz about our Cougars. Of course the real buzz is in the “What if?” What if the Cougars beat the Bruins this weekend? What if they beat at top 10 team on the road (in the Rose Bowl no less)? What if they follow that up by winning against Michigan in the Big House, and end the season undefeated? Will they make the playoff? Should they make the playoff? We’ve all heard about BYU’s path to the playoff. They have no guaranteed spot at the table. Comparisons were made to the Big 12 last year, when their champion was snubbed, having not played in a conference championship game (of course there’s an easy way to solve that problem AND BYU’s, but that’s not the point of today’s post). The question I’ve seen raised on social media this week has been this: If BYU wins out, would they make the playoff? Should they? And there’s been a lot of debate, especially comparing BYU’s schedule to Ohio State’s. Consensus seems to be that while tOSU’s schedule has Michigan State, when you look at the balance of the schedules, one isn’t necessarily stronger than the other overall. And you know what? That’s all that matters. Tom Holmoe has put together an aggressive schedule – the kind that Bronco was talking about when we first went independent: Nebraska, Michigan, UCLA, Missouri, Boise State, East Carolina, UConn. It’s a daunting schedule, especially when you consider the first three are all on the road and in September. And this Cougar team will either live or die by their tough schedule. Because they have to. BYU has no easy road to the playoff. They don’t have a conference championship to fall back on if they lose out of conference. We are asking if they would make it if they’re undefeated, and it’s not a sure thing. Losing even a single game completely eliminates them from the discussion–even against a top ten UCLA team. Now I believe I hear some Cougar faithful shouting from the back. I’ll take your question, even though I think you’re being rude about it. No, you can’t justify the loss as a good one or even an expected one. BYU has to use their schedule as their resume to prove to the selection team that they deserve a shot at the playoff. Lose to UCLA and you have had your shot. So that’s what it comes down to. BYU is in the playoff already because that is their season. They are in a single-elimination, 14 game playoff every single year. Because if they lose one game, they’re guaranteed a spot in the Poinsettia Bowl, and that’s where they’ll be. 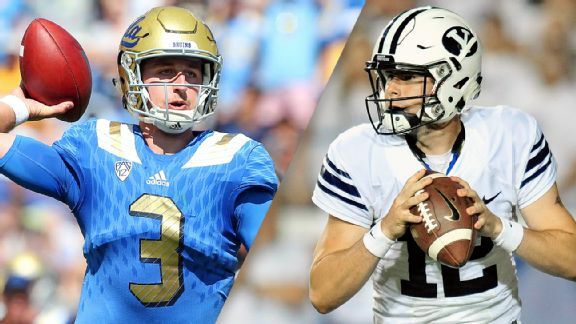 On Saturday BYU will be playing UCLA in the Rose Bowl. At the time of this writing, UCLA is ranked 10th in the country and is favored by 16.5 points over the Cougars. BYU, this is your playoff game. And so is the next one, and the next one, and the one after that until you win it all. But you have to win Saturday first. You have to find a way to win as an underdog for the third time in as many weeks. You will need Tanner Mangum to do his thing and find a way to win. Can it be done? Of course it can. This would not be the greatest upset of all time. This would be a major upset and a huge victory for the Cougars. After the Nebraska Hail Mary, some folks were asking where that victory ranked in BYU’s all-time wins, and many people placed it quite high on their lists. And with good reason–it was a great victory. But it was nowhere near the level of beating #3 Oklahoma down in Jerry’s House. In UCLA, you finally have that kind of stage and that caliber of opportunity again. A top ten team, on the road, in an amazing venue. It’s the perfect opportunity for the Cougars. Is it an easy win? Obviously not. But the Cougars CAN win this game. And if they do, well, they just might justify the hype they’ve been generating over these first two weeks. Oh, and they’ll advance to the 4th round of BYU’s annual college football playoff. Go Cougars!